Delicata squash, also referred to as Peanut squash or Bohemian squash, has a sweet nutty flavor and is best during late summer/early fall. It’s nearly fiber-less flesh yields favors of corn and sweet potatoes, and has a creamy texture. The flavors are more concentrated when roasted. 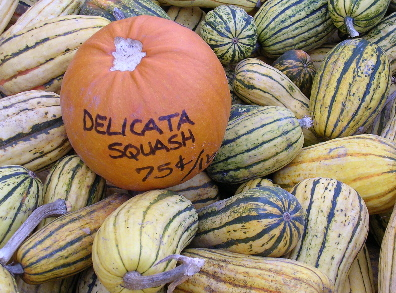 When buying a Delicata squash, look for a firm cylindrical shape with elongated ridges and pale-orange or yellow skin with green striations. 2. Brush cut sides of the squash, apples and garlic with olive oil. Arrange them, cut-side down on a large rimmed baking sheet, tucking garlic beneath squash in hollowed out cavities. Roast in oven for approximately 30 minutes, until squash and applease are tender when pierced with a fork. Set aside and let cool; approximately 20 minutes. 3. Using a spoon, scoop flesh from squash and apples; discard skins. 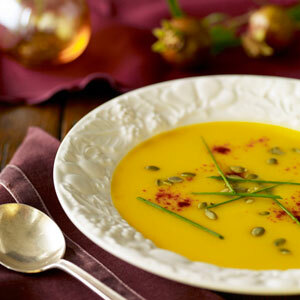 Place roasted squash, apples and garlic in the bowl of a food processor fitted with a metal blade. Process to a smooth puree. Add 2 cups borth and continue processing until smooth. Transfer squash mixture to a medium saucepan over medium heat and add remaining 2 cups broth, buttermilk or cream, nutmeg and salt. Bring mixture to a simmer, not a boil. Cook for 10 minutes, season with pepper and set aside to keep warm. To serve: Ladle 3/4c into a bowl and top with fresh sage sprig or a couple pieces of popcorn and sage. Add pepper to taste.